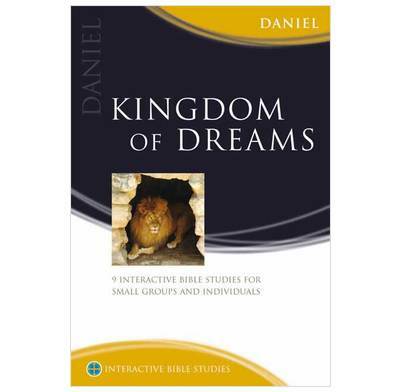 Kingdom of Dreams captures the wonder of the book of Daniel. The lion's den... the fiery furnace... the writing on the wall... the four-headed beast. The book of Daniel contains some of the Bible's most vivid and unusual stories. It's an exciting read, but a disturbing one too. Are they just rattling good stories to tell children, or do they have some significance for adults? And what are we to make of Daniel's strange dreams and visions? Set during an exile of God's people in Babylon, the book of Daniel gives us a dramatic account of how God provides his people with hope amidst adversity. It's story of God's faithfulness to those he loves. Kingdom of Dreams captures the wonders of this part of the Bible, steers a straight path through the difficult passages, and leaves us with a deeper understanding of the King of Kings. 2. So... do you fit in? 5. Who's the King around here? 8. Oh lord, hear and act! We used this book for a home-group study guide; the studies were to coincide with teaching from Daniel on Sunday mornings. Having now completed the series of 9 studies I can say that we used most of them pretty much as printed, with a little adjustment of the questions in some cases. I would, though, point out that the first study is more of a primary school type introductory activity and we skipped it entirely. Having said that, I know that another home-group did it and loved it. We did feel that some of the early studies were a bit basic and obvious in their content - great for a beginner group but perhaps not stretching for a more experienced one. We actually replaced some or all of the printed questions with our own on several occasions. Be aware too that when the book moves into the 2nd half of Daniel where the content is more apocalyptic, the author uses the Bible text to discuss other themes such as prayer or suffering, rather than examine the text for its prophetic content. This is fine and works well, but might not be what a purchaser was expecting. In summary, I would say that we followed the printed studies more and more completely as they progressed through the book. I would happily recommend these study guides, but I would suggest that they are used as a valuable resource rather than a strict programme. I've used this in my home group (though it can also be used for personal study). Found it to be a really helpful resource, with excellent questions and cross-references to related Bible passages. We ahve been studying Daniel with this guide as a small group of young people (age 17-22) at uni. We hadn't used a guide before, but have found this one very good - it has encouraged all of us to prepare properly before the study, and has meant that everyone in the group has now had a turn at leading -something that is quite an intimidating thought if you are not using a guide! I think we would def use one again, which is a pretty good recommendation for a group that hasn't used one before! Daniel is an odd book in many places, and so far (we havent finished it yet!!!!) it has dealt very well with this. Check it out!